Abuja, Nigeria. May 22nd, 2014 - Latest Football snap poll results released by NOIPolls have revealed that the majority (69%) of Nigerians predict that Real Madrid will win the UEFA Champions League final scheduled for the 24th of May 2014. Responses from the poll show that support for Real Madrid was highest in the North-Central region (80%) and slightly higher among female than male respondents(74% compared to 69%). Furthermore, Real Madrid was also rated the best team in the Champions League this season by the majority (38%), followed by Atlético Madrid (21%) and Chelsea FC (11%). Furthermore, almost half of the adult Nigerian population (46%) confirmed they have watched the UEFA Champions League this season. These were some of the key findings from the Champions League Snap Poll conducted in the week of May 12th 2014. The UEFA Champions’ League is an annual continental club football competition organized by the Union of European Football Associations (UEFA) since 1992, and formerly known as European Champion Clubs' Cup as far back as 1955. The final for this year; the 59thchampions’ league final holds on Saturday 24th of May, 2014 at the Estádio da Luz in Lisbon, Portugal. 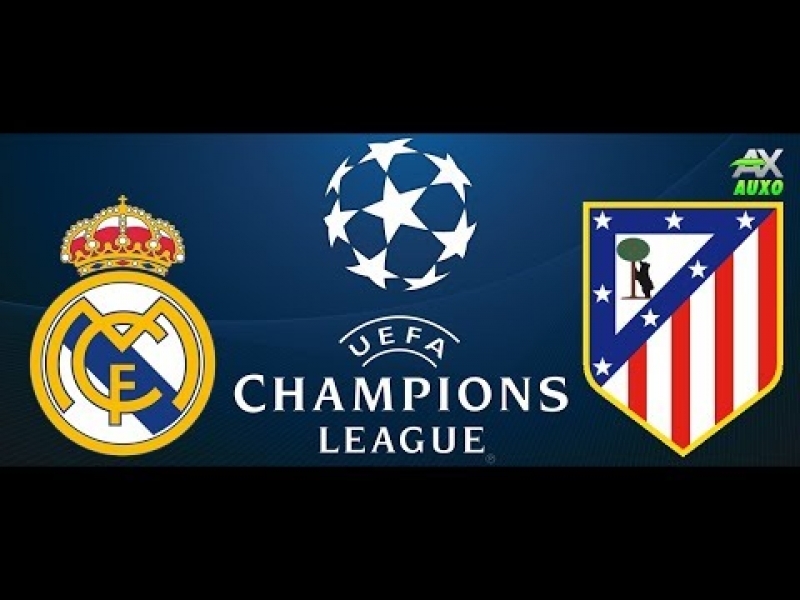 The beauty of this year’s final is that it will be a derby match between two Spanish sides, Real Madrid and Atlético Madrid; the first time in the tournament's history that the final will feature two teams from the same city. This is also the second all-Spanish final, after the final between Real Madrid and Valencia in 2000, which ended 3-0 in favour of Real Madrid. Real Madrid has been in 12 previous Champions’ League finals winning 9 times while Atlético Madrid has been to the final once and that was in 1974 but they have never won the Champions’ League. Atlético Madrid and Real Madrid have met each other in the Spanish La Liga four times this season with Real Madrid winning twice, Atlético winning once and with the final match ending in a draw. Atlético Madrid recently became the La Liga Champions after a ‘winner takes all’ match against Barcelona FC on the final day of the season; a 1-1 draw was enough to give them their first league title since 1996. Against this background, NOIPolls conducted its recent Champions' League Snap Poll to ascertain viewership of the tournament, seek the views of Nigerians on the best team in the tournament this season and finally, the team respondents anticipate will win the UEFA champion’s league final. Respondents to the poll were asked three specific questions. Firstly, In order to ascertain the viewership of the game this season, respondents were asked: Have you watched the UEFA Champions’ League this season? Results show that 46% of the respondents answered positively, implying they watched the UEFA Champion’s League this season, while a majority(54%) of polled respondents responded negatively. Respondents who responded negatively had their interviews terminated since subsequent questions can only be answered by those that have watched the Champions league this season. Respondents who confirmed that they have watched the League this season were further asked: In your opinion, which was the best team in the UEFA Champions’ League this season? Responses to this question revealed that the majority (37%) indicated Real Madrid was the best team in this season; followed by Atlético Madrid with 21% and Chelsea FC with11%. 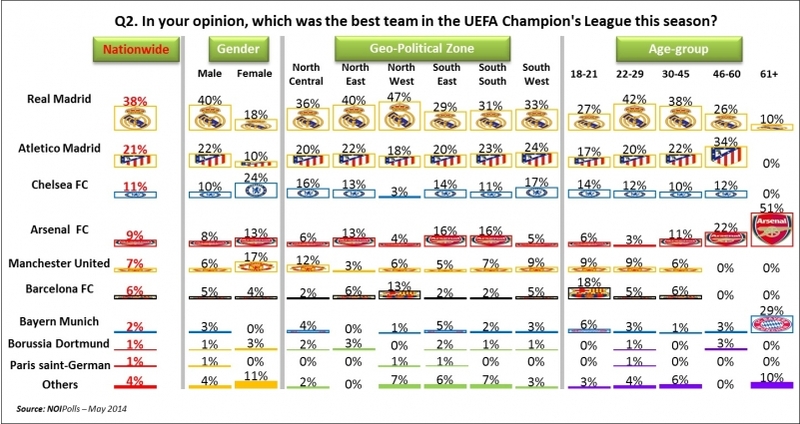 Analysis across geo-political zones revealed that Real Madrid was considered the best team in this season across all zones while the North-West zone has the highest (47%) proportion of respondents. Furthermore, support for Atletico Madrid was almost evenly spread across the geo-political zones, however, overall the South-West (24%) was highest. Analysis by gender indicates that on the one hand, more female than male respondents favour Premier League teams; Chelsea FC (24%), Manchester United (17%) and Arsenal FC (13%) as the best team this season. On the other hand, more male than female respondents favour La Liga teams; Real Madrid (40%) and Atletico Madrid (22%) as the best team in this season. Analysis by age-group shows that those aged 60 years and above have the highest percentage of respondents who indicated Arsenal FC (51%) and Bayern Munich (29%) as the best team this season. In addition, the majority of the respondents who indicated Real Madrid were between 22-29 years of age (42%), while the majority who indicated Atletico Madrid were aged 46-60 years (34%). Finally, respondents were asked: Which team do you think will win the UEFA Champions’ League final on 24th of May? Overall, majority (69%) of the respondents are optimistic that Real Madrid will win the trophy this season while 31% of the respondents think Atlético Madrid will lift the trophy. Findings based on geo-political zones show that the North-Central zone has the largest (80%)proportions of respondents that believe Real Madrid will win, followed by the North-West zone with 74%. The North-East zone (38%) has the highest percentage of the respondents who think Atlético Madrid will win the trophy. Furthermore, more female (74%) than male (69%) respondents predict Real Madrid will win the final while respondents aged 60 years and above unanimously (100%) stated that that Real Madrid will win the trophy. In conclusion, results from this poll have revealed that almost half (46%) of the adult Nigerian population confirmed they watched the UEFA Champions League this season. More findings have revealed that Real Madrid was rated the best team in the tournament this season by the majority (38%) with the North-West zone giving the highest rating; 47%. This is followed by Atlético Madrid (21%) and Chelsea FC (11%). Furthermore, 69% of the respondents foresee Real Madrid as the winner of the UEFA Champions League final match scheduled for 24th ofMay 2014. The highest support was shown by respondents from the North-Central region(80%) and slightly higher among female (74%) than male (69%) respondents. Finally, though both teams have shown their resilience, consistency and remarkable football skills and majority of Nigerians have spoken in favour of Real Madrid; only one team can win the trophy and this will be brought to light come 24th May, 2014.